I don’t know about you, but after all of the hectic craziness of the holiday season, I get into the mood to just start fresh! It seems no matter how hard I try December is always a whirlwind – between all of the parties, luncheons, gift exchanges and goodie baskets to make. By the time January rolls around, I get motivated to plan some clean, fresh menus for my family. And luckily this time of year is the perfect time to add the ingredient that says fresh better than any other—citrus! Last year about this time, I made my first batch of orange marmalade, which is a type of fruit spread made with any type of citrus fruit sliced, diced or ground and suspended in a clear jelly. The recipe turned out great but I found out that there are “long boil” recipes and those that use pectin to set them up. 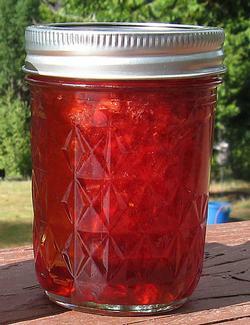 This year I tried a recipe that uses pectin so it not only tastes great but is very easy to do as well! It is the perfect way to add a little sunshine to a chilly morning. PREPARE canner. Heat jars in simmering water until ready for use. Do not boil. Wash lids in warm soapy water and set bands aside. ADD strawberries and lemon juice to peel and mix well. Gradually stir in pectin. Bring mixture to a full rolling that cannot be stirred down, over high heat, stirring constantly. Process in a boiling water or atmospheric steam canner for 10 minutes at 0-1,000 feet elevation, 15 minutes at 1,001-3,000 feet, 20 minutes at 3,001-6,000 feet, 25 minutes at 6,001-8,000 feet, and 30 minutes at 8,001-10,000 feet. UCCE Master Food Preservers are available to answer home food preservation questions; leave a message on our helpline at (530) 621-5506. For more information about our public education classes and activities or to make a donation, go to the UCCE Master Food Preservers of El Dorado County website at http://ucanr.edu/edmfp. Sign up to receive our E-Newsletter at http://ucanr.org/mfpenews/. You can also find us on Facebook.